Try your hand at finding Cripple Creek turquoise, topaz and other gems as well as real gold. 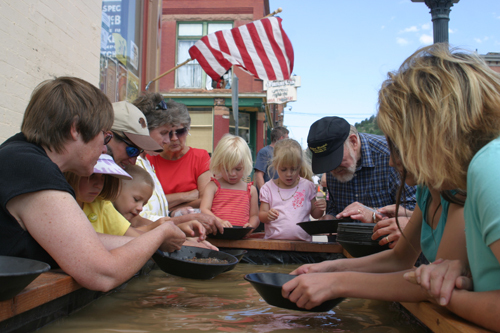 The museum hosts panning thru Labor Day and panning for real gold over Gold Rush Days the third weekend in July. This activity is made possible by a grant from the El Pomar Youth in Community Service grant. Amateurs welcome - professionals welcome to demonstrate but please leave the gold for the kids. Please read our gold panning rules.